Roe and red deer are the only deer species native to Britain, and both have a long history of persecution. Diminutive in size compared to red deer, roe deer also have much smaller antlers which are sometimes straight, or can have up to three points. They are humbler in stature then reds, measuring around 2.5 feet at the shoulder. They have a beauty and elegance of their own, however, and in summer they are a gorgeously rich tawny-red, which deepens to black or brown as the year grows colder. They have a distinctive white patch on their rumps that they will flash when alarmed. Roe deer have been here since the Mesolithic period—where their hides, bones and antlers were used in the creation of various tools and articles of clothing—roaming free in the dense woodland that was abundant with hazel, birch, lime, elm and oak at that time. They were close to extinction in Britain by 1800, with the majority of the population surviving in Scotland. They were introduced to several places in the UK during the Victorian era, and have since naturally spread, and can now be found in many places in Britain, including Wales. Roe deer have a some remarkable traits. Bucks, in a bid to impress does, flatten woodland brush layers into figure of eight shapes that are known as ‘roe rings’. When they have mated, between July and August, the fertilised egg will not implant or grow until the following January, which means that the young will be born in the warmer spring months, improving their chances of survival. 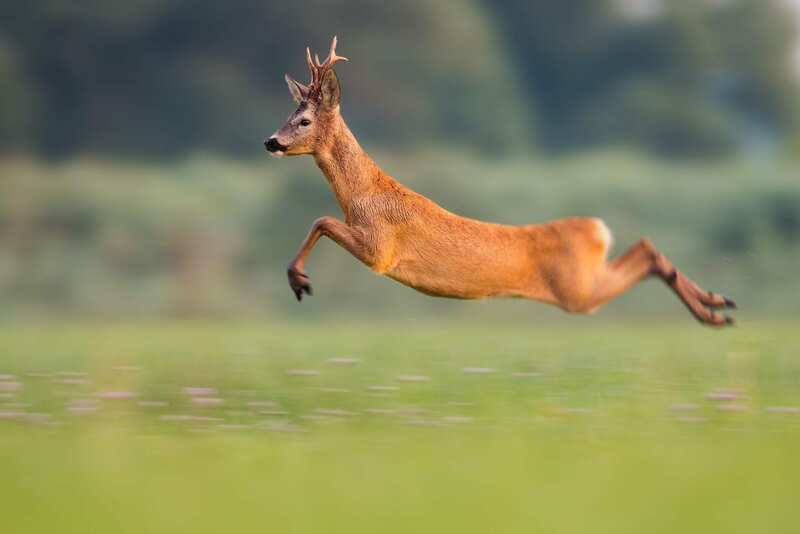 Roe deer have a range of distinctive calls: a short dog-like yap for danger, a high-pitched piping call when does are attracting a mate, which is met with a guttural rasp by the bucks. The rut is from July to August and at this time bucks can become aggressive as they protect their territory and does. Roe deer are generally solitary, but do form small groups in the winter. Roe deer are crepuscular and prefer the whispering quiet of woods to open countryside, which is why they are seldom seen and perhaps contributes to the long heritage of mystery and folkloric significance deer hold. They are associated with the Celtic ‘Horned God’ Cernunnos, an ancient god of fertility and wild animals, who was often depicted with deer and antlers. In our land’s ancient history, both common folk and kings have used deer-inspired adornment; Neolithic cave art depicts people wearing hides and antlers, and the excavated Anglo-Saxon royal ship burial at Sutton Hoo revealed the king chose to display his power and status with a sceptre elaborately decorated with a stag. In Celtic traditions deer can pass between this world and the Otherworld and their antlers, shed once a year, symbolise fertility, rebirth and rejuvenation. Deer and their behaviours such as browsing, rootling and trampling, checks scrub growth and contributes to diverse and shifting mosaic of habitats, and the use of large browsing herbivores such as roe deer has been successful in rewilding projects, like that at Knepp Estate.